Large comfortable cottage . Wonderful setting and location! Now booking weekly rentals. Saturday to Saturday. Just off Ocean Road in the Point Judith section of Narragansett, A quiet treed Location adjacent to the 60 acre Christian Brothers Center and retreat. Enjoy the sound of the surf from the large deck! Three minute walk to State owned Black Point Oceanfront and Walkway. 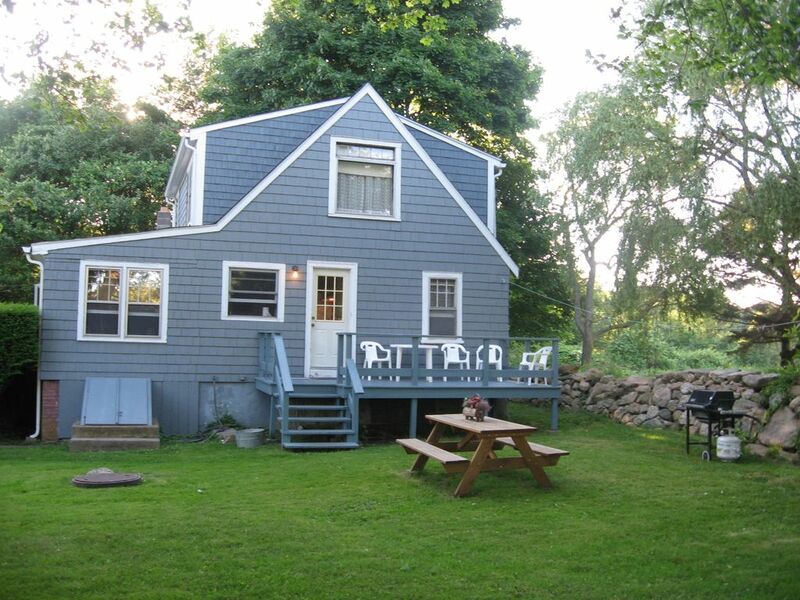 This is great for sunbathing surf casting or just enjoying the outstanding views of Narragansett Bay . A beautiful Ocean front walk to Walk to Scarborough State Beach. 5 Minute drive to 5 major Ocean beaches and fishing village of Galilee. Scenic 20 minute drive across Jamestown and Pell Bridge to Historic Newport for concerts shopping and fun! The property features lots of space inside and out. Deck, picnic table, out door shower. Sunny lawn and shady sitting areas. Peaceful and close to all wonderful amenities of our coastal town! The 1st level has two bedrooms and full bath. Fully equipped kitchen leads to a large deck. There is a dining room, large living room with fireplace and a sitting room all on the 1st floor. Second floor three bedrooms and second full bath. Moved permanently to Narraganset in 1978. Fell in love with the area after graduating from the University of Rhode Island which is very close by. Totally enjoy the natural beauty and peacefulness all around South County. Also enjoy the activities. Festivals ,concerts and other events seem to happen every week! Own the cottages with my wife and live about one mile away we are always available for our guests. Dad of five. Love when the youths come to visit. Sailing instructor and boating enthusiast.. Peaceful unique property in wonderful setting! Lots of space and room for everyone to enjoy themselves inside and out. Including a sitting room, dining room and large living room. Shady deck for afternoon relaxing enjoying pastoral views of Christian Brother's Center. Enjoy the sound of the surf and chiming bells from next door. All the amenities for a great and convenient vacation. Beautiful setting sharing a common wall with the Christian Brother's 50 acre retreat. Enjoy the church bell chimes and the sound of the sea. 5 Minute walk to the Ocean. And 5 minute drive to 5 major ocean beaches and all Narragansett attractions. Two full baths one on 1st and one on second. Outside hot and cold water shower. Scarborough State Beach no entrance fee to walk onto beach. Moderate surf. Boardwalk. Five beautiful ocean beaches with in five minute drive! 3 minute walk from the cottage to the Ocean. Beautiful views of Narragansett Bay and sun bathing. Black Point Walkway is state owned ocean front pathway to full service Scarborough State Beach. Assigned off street right in front of cottage. Large with FP and two large windows with nice views. Many local concerts and events occurring all season. Mystic Aquarium and Mystic Seaport 45 Minutes. Foxwoods Casio and entertainment also 45 minutes . Short beautiful drive to Newport. Great house! Perfect for enjoying the beaches and close to the Block Island Ferry. We had 10 adults and Everyone had a place to sleep without being on a couch! Lots of room with places to play games or sit and read or watch TV. There were 9 of us and we had plenty of room. The House was as described and clean. Thanks Julie. We are happy it worked out so well !!! Our goal is to make our guests experience the very best it can be. So we are disappointed and very concerned anytime a guest is not satisfied. Often guest's comments have guided improvements and up grades to the cottage. We began renting to Narragansett visitors 1979 having purchased in 1978. In twenty eight years we have had very few dissatisfied guests. 2) Lights upstairs. there are 5 overhead lights on the second floor. When checked (today) all working properly. One table lamp needed a bulb. 3) The rustic bedroom on the 1st did not have blinds on the side that faces undeveloped woodlands. I understand that this can cause discomfort.These windows will get blinds before the next rental season. 4)The mentioned kitchen items will be replaced/restocked before next season. Had an amazing time in Narraganset! I loved the property and you could hear the ocean waves at night. Ny handicapped brother had no problem getting around. We are happy that the cottage accommodated your group and that you had a great time. It is of utmost importance that our guests truly enjoy their time. Strengths - great location, quiet street, walking distance to Scarborough beach. Close drive to Pt. Judith and Newport. Steve is an overall nice guy. Weaknesses: Pictures online are considerably much nicer than the house actually is. House is musty smelling, wall-paper in upstairs bedrooms is peeling off and dirty. Hot water baseboard, refridgerator, dishwasher have a lot of rust. Holes in ceiling and cracks in wall paneling are often covered with tape. Light fixtures are ancient and many are uncovered showing light bulbs. Bathrooms are dirty, old, and lower tub faucet leaked hot water. Nothing really worked well and things that were fixed were fixed poorly. Thank you for the positive feedback on our "great location and grounds". The cottage was built in the 50's and is spacious and rambling with 10 rooms. Each year we complete projects to improve the physical structure and make it more enjoyable for our guests. Two years ago it was a new shower and 2nd floor bathroom upgrade. Also that year most of the windows were replaced. This year saw a new stove for the kitchen and new deck furniture. We recently installed a hot and cold water outdoor shower. I am happy to report that the three things that you pointed out have been taken care of. We take great care and pride in providing a clean and comfortable vacation home for out guests. Quiet treed location adjacent to Christian Brothers Center and retreat. Large deck to enjoy the views and relax after a busy day.Three minute walk to the Ocean and the scenic Black Point Walkway. There are hiking trails.Walk along the coast line to Scarborough State Beach. Minutes drive to: five major ocean beaches, Pier Village shops and many excellent restaurants. The authentic fishing Fishing village Galilee is a 5 minute drive. Buy lobster off the boats. Go on a half day charter fishing boat. Catch Block Island Ferry for a quick trip to the island.! Picturesque Point Judith Light and park just down the road! Bike paths nature trails all close by. pets and pet deposits by individual case.